FIIs were net sellers of equity on Fri. (Nov 30), but net buyers on the first four days of the week. Their total net buying was worth Rs 23.3 Billion. DIIs were net sellers of equity on Wed. (Nov 28), but net buyers on the other four days. Their total net buying was worth Rs 25.2 Billion, as per provisional figures. For the month of Nov ’18, FIIs were net buyers of equity worth Rs 49.3 Billion. DIIs were also net buyers of equity worth Rs 13.1 Billion. Both were net buyers in the same month for the first time since Mar ’18. With FIIs and DIIs in buying mood, Sensex and Nifty rose to completely fill the downward ‘gaps’ formed on Oct 4. India’s GDP growth slipped to a lower than expected 7.1% during Q2 (Jul-Sep ’18) from 8.2% during Q1 (Apr-Jun ’18) and 7.7% during Q4 (Oct-Dec ’17). For the half year (Apr-Sep ’18), GDP growth was 7.6%. Government’s fiscal deficit during Apr-Oct ’18 was Rs 6.48 Trillion, which was 103.9% of the full year target of Rs 6.24 Trillion. Revenue collections moderated while spending remained almost flat. During Apr-Oct ’17, fiscal deficit was 96.1% of the full year budget estimate. The daily bar chart pattern of Sensex clearly shows the effect of FII buying. After massive selling in Oct ’18, FIIs were enthused by the sharp fall in oil prices and the consequent strengthening of the Indian Rupee against the US Dollar. With DIIs joining the bull bandwagon last week – after being net sellers of equity till Nov 22 – the index jumped above the 91 points downward ‘gap’ (formed on Oct 4) with an upward ‘gap’ on Thu. Nov 29. By closing above 36140 – which is the 50% Fibonacci retracement level of the 5698 points correction from the Aug 29 top to the Oct 26 bottom – Sensex has moved back into bull territory, which has been technically confirmed by the ‘golden cross’ of the 50 day EMA above the 200 day EMA. 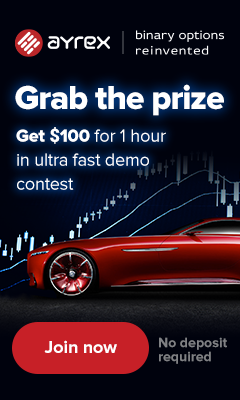 Celebration time for bulls? It would appear so. However, the index is not quite out of the woods yet. Why? A few reasons. An index (or stock) can sometimes face resistance from the 61.8% Fibonacci retracement level (which is at 36810 for Sensex). Also the filling of a downward (‘measuring’) ‘gap’ is often followed by a resumption of the previous move prior to formation of the ‘gap’. Of late, the Advance-Decline line (not shown) has been showing negative divergence by falling while the index has been moving up. 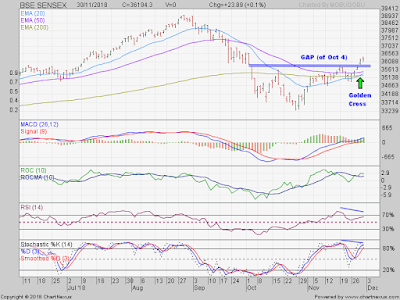 So, a convincing move above 36810 is required for bulls to regain full control of the chart. If FIIs continue their buying during Dec ’18, that may happen sooner than later. The lower GDP number and widening fiscal deficit are matters of concern, and can affect bullish sentiment. The possibility of the opposition winning at least two of the five state elections may bring bears to the fore in the near term. Daily technical indicators are in bullish zones. MACD is rising above its signal line in bullish zone. ROC has crossed above its 10 day MA and is at the edge of its overbought zone. RSI is just below its overbought zone. Slow stochastic has re-entered its overbought zones. Note that RSI and Slow stochastic are showing negative divergences by touching lower tops, and can trigger a pullback below the ‘gap’ towards the 200 day EMA. Small investors should remain cautiously optimistic – but avoid lump-sum buying in ‘cheap’ stocks. The weekly bar chart pattern of Nifty finally managed to close above its 20 week EMA after 10 weeks. By touching an intra-week high of 10922 and closing at 10877, the index has just about retraced (Fibonacci) 50% of its fall from its Aug ’18 top to its Oct ’18 low. In the process, the index has completely filled the 89 points downward ‘gap’ formed on Oct 4 (on the daily chart). Friday’s trading formed a small ‘doji’ candlestick (on the daily chart), which indicates indecision among bulls and bears, and can lead to a corrective move. Weekly technical indicators are in bearish zones, but showing some bullish signs. 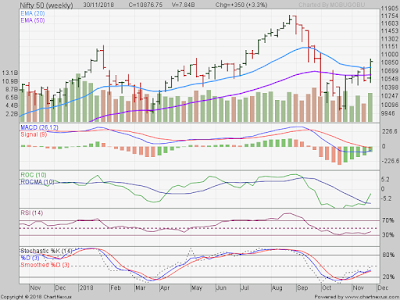 MACD is moving sideways below its falling signal line. ROC has crossed above its falling 10 week MA. RSI and Slow stochastic have started to move up. Nifty’s TTM P/E has moved up to 26.31, which is well above its long-term average in overbought zone. The breadth indicator NSE TRIN (not shown) has re-entered its oversold zone, and can trigger some index upside. Bottomline? FII buying triggered counter-trend rallies on Sensex and Nifty charts from their Oct ’18 lows. Earnings growth of India Inc. belied expectations. Possibility of opposition wins in a couple of state elections are causing some jitters. Better to remain on the sidelines, till election results are announced on Dec 11.